We have all heard the story about how Target knew a man’s daughter was pregnant before he did based upon her purchasing habits. Other data manipulation stories continue to make the headlines - how Facebook experimented with emotional contagion by manipulating content on people's news feeds, or the Orwellian sounding “God View” at Uber that allows them to see precise locations of their customers in real time. These only show the tip of the iceberg - the dream of Big Data is to evolve the capture of these massive data sets and move this from real time business intelligence (how many products have we sold in this location?) to predictive insight (how many products WILL we sell in this location?). Big Data then is predicated on the application of Machine Learning - utilizing specialized computers to vastly extend and improve our ability to extrapolate knowledge from past experiences to apply to new and unfamiliar situations. So having a computer powerful enough to beat a human at Jeapordy being able to predict future outcomes based on inference. Big Data is vastly out of reach right now to anyone other than a very small subset of organizations who have the budget and expertise to leverage vast data collection and storage methodologies, access computers with machine learning capabilities, and more importantly utilize data scientists with high levels of subject matter and linguistic expertise to confirm causation. This in fact may be a good thing in the scheme of things. Fears about its application and potential misuse have re-ignited the fears brought forward by Orwell, and will no doubt spur large legal and ethical debates, especially as the Internet of Things and the “sensorfication” of our environment brings forth new opportunities to track and monitor our every move. There are some other buzz words popping up in 2015 that touch on this. From ‘Incognitorati’, a desire to hide from tracking technology online, to ‘Sensor Dodging’, or creating physical clothing that hides you from real world sensors, data backlashes may be bringing much bigger storm clouds on the horizon. How do we define “Small Data” then? “Small-data” business intelligence quite simply refers to having an application engine sitting on top of a database. Right now organizations face the threat of “data paralysis” - drowning in a sea of information, which leads a business to paralysis or egoism (entrenched mental models that cause only inward outlooks). Success right now hinges on the ability to adapt to complexity, and without the right signals extrapolated from the noise, failure can accelerate a lot more rapidly. When you look at the Internet Marketing Landscape, things start to look quite complex (and there are a lot more new players who need to be added to this list). When you look at the Marketing Tech landscape, you are likely to go even more cross eyed. We come then to our final buzz word of this year - ‘Simplexity’. This is the act of simplifying complex elements down into smaller, actionable insights, which forms the solution to the Huxley trap. Successful use of small data is about extracting information from a source using tools, displayed through a custom report utilizing dimensions and metrics against key performance indicators. This is then sliced and drilled down using advanced segments before being reviewed by an analyst to create actionable insights with the biggest business impact. Using this statement, we can apply this through an analytics framework, one that was originally developed by Avinash Kaushik called the "complete digital analytics ecosystem". This is designed to make understanding and executing digital analytics a lot more simple. Firstly, when we talk about the database to work from, most likely the best place to start is with Google Analytics (GA). That being said, this framework applies to any number of data sets you might be generating for the business. Let’s kick things off with metrics and KPIs. Metrics and KPIs are our foundation. The definition of a metric is a number. Usually a sum or ratio. The definition of a KPI (Key Performance Indicators) is a metric that let’s you assess how you are progressing against an objective. Some metrics will never be KPIs, because they won’t have an impact on your business. The key thing to remember with KPIs is objectives. An objective is an understanding of where you want to be. If you don’t know where you want to go, you will end up in a lot of trouble down the line. The definition of a dimension is an attribute of the visitor. The goal of dimensions is to ultimately change the lens we apply to people, so that a "visitor" becomes a "person" - a more humanized view of the people engaging with us. In a lot of tools like GA, Dimensions tend to appear in rows in a table, and metrics appear in columns. I must admit, I struggled at first in understanding the difference between metrics and dimensions. It takes a bit of use of tools and playing around with data to learn the terminology and what constitutes each. Here is an example. A Dimension ‘City’ might have a Value of ‘San Francisco’. A metric then could be ‘Population’ expressed as a sum ‘800,000’. Google Analytics has a list of Dimensions vs Metrics in their Developer Guides, or you can pick it up by playing around in the reports. This stage is about moving from ‘web reporting’ to ‘web analysis’. There is so much data that we can report on, but again, this leads to the Huxley drowning in irrelevance scenario. As the name suggests, a Custom Report is simply a personalized view of a set of dimensions and metrics relevant and specific to your organization. Custom Reports start from a blank slate, and then get built by finding out the hard questions you need to answer. This usually results from customer interview or journey mapping, talking to peers and forcing leadership to sit down and workshop. This can be a huge challenge and get very messy (especially in big, hierarchical organizations), but if you can’t formulate the right questions you won’t understand what needs answering. Make it business critical. Data displayed in a custom report is presented in aggregate - in other words the entire universe. In order to get actionable insights however, you need to drill down to micro-clusters of information (such as specific customer groups), which occurs through the use of Advanced Segments. The easiest first step is to think about segmenting audiences into Acquisition, Behavior and Outcomes buckets. From here, you can move to things like Cohort-Analysis (very popular with the startup crowd) or Sequence Segments. This forms the core of the framework, represented by the following diagram. Next, we look at the Inputs to our core framework. Firstly, we have our Business Priorities. This needs to come from the top, and be the true north that the organization is striving for. Work out short and long term goals. Second, we need to input the competitive reality. These will firstly be the direct organizations you are in competition with. Secondary to this will be indirect competitors that may be threats (for example a pizza delivery chain might have thought other pizza delivery chains were their only competition until Seamless and Grub Hub showed up). Type in top category queries into a search engine, and you should quickly see who the competition are in organic and paid listings. The goal here is to conduct competitive intelligence analysis - key strengths, what they do differently, what their visitor trends look like etc. Third and last are New Opportunities. These are the big things that don’t pop up very often, but may require you to shift gears or pivot. Say like Seamless and Grub Hub affecting your pizza delivery business! This will look like the following. At the bottom of the framework, we have the tools used to collect the data. At the top, we have the analysts who will interpret the data once it has flowed through the core, and add actionable insights back to the organization. Without these, data really is useless. Avinash has something he calls the 10/90 rule here when thinking about this. Tools are only there to help people, so you should be investing 10% on the consulting and cost to implement and maintain your tools, and 90% on the smart people who are analyzing the data for you. If you doing this ratio differently, it might be time to stop and adjust. When a data framework is first set up, what most likely is produced are “data dumps”. You get excited that you can get all of this data, and pull it all out to show everyone. Unfortunately this is incredibly hard to drive insight. Next, you will start to get people asking for custom versions of the data dump - they are starting to see value and are asking deeper questions of it. This may evolve into specific reports for departments or teams, but is still mainly a more narrow data dump. The last evolution is the move to data output showing Insights, Actions and Business Impact, driven by heavy use of analysts. Insights are findings from the data. This is likely determining why something happened, and what caused it - “The data suggests x happened because of the causal reasons of y and z”. Actions are specific steps the business should take as a result of the insights. For example “Triple Paid Search budget on this list of keywords”, or “Focus on products abc in this city, and def in this other city”. Lastly, Business Impact is a computation that quantifies what you think will happen if you take the action. So for example “Triple Paid Search on this list of keywords. We believe this will increase revenue by $100k per week”. The great skill in data analysis is being smart enough to recognize correlation from causation. Data doesn’t create meaning, humans do, so make sure you are confronting your inherent mental models, and ensuring you are not just using data to confirm your internal biases. This process may surface some hard truths for the organization to confront - the risk is in not accepting the results and coming up with new plans and strategies. Just like new habits or New Years resolutions tend to fail when you try and achieve too big a goal all at once, implementing a small data framework all at once can be a recipe for failure. The goal is to implement slowly, level up all departments at once, and show wins to justify the investment. Avinash outlines a three step process to implement the framework in a standard hierarchical organization. If you work in a more dynamic and responsive organization, cut down the timeframes. If you work in a financial institution or a franchise business, you might have to triple it. This is about putting the nuts and bolts in place, and identifying the first sets of metrics and the business priorities. Expect this to take about 6 months. This is about moving to data reporting. It begins with Data Dumps, prioritizing getting smart Analysts on board, and setting up more Custom Reports and Advanced Segments to get Customized Data Dumps. Expect this to take 6 months, leading you to 12 months. This is about learning to identify insights, and then developing competitive intelligence. You can deliver Actionable Insights, and evaluate and monetize relevant new business opportunities. Expect this to take 9 to 12 months, continuing for the life of the business. Big Data is a big buzz word of 2015, but this should not be confused with Small Data, and the actionable data you can actively capture, analyze and create business impact. 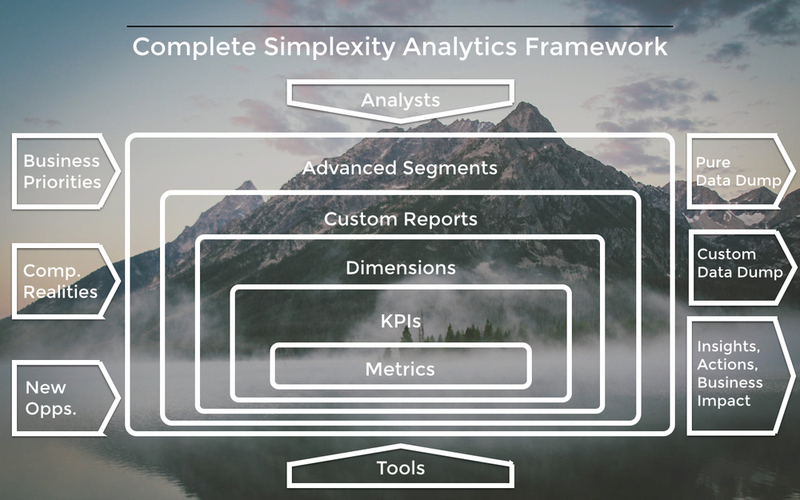 If you currently don’t have a proper analytics framework in place, now is the time to think about shifting your investment and focus and adopting the Simplexity Analytics Framework. Huxley's “sea of irrelevance” is only likely to rise deeper and deeper as the volume, velocity and variety of data keep accelerating. Newer PostNotes from the Field #2: A Sport is a Sport is an eSport?